For extraordinary heroism in connection with military operations involving conflict with an armed hostile force in the Republic of Vietnam: Staff Sergeant Dunlop distinguished himself by exceptionally valorous actions on 16 April 1968 as a leader of a ten-man long range reconnaissance ambush team operating near Binh Son. 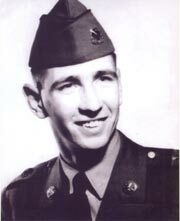 Sergeant Dunlop deployed his team along a main Viet Cong supply route and triggered a claymore mine ambush on a heavily armed enemy platoon which was walking down the trail. During the ensuing battle, he fearlessly exposed himself to enemy weapons to deliver a devastating volume of fire which inflicted many causalities on the numerically superior insurgent force. Seeing a wounded comrade close to the enemy positions, Sergeant Dunlop unhesitantly ran to the man's aid. During this maneuver, he was struck in the legs by a burst of automatic weapons fire and knocked to the ground. Continuing to fire, he crawled the last twenty meters to his wounded teammate, all the while shouting commands for fire support to his men. Finding his comrade dead, Sergeant Dunlop directed his team to continue its covering fire while he extracted the body. As he neared safety, Sergeant Dunlop was again struck by enemy fire and mortally wounded. Staff Sergeant Dunlop's extraordinary heroism and devotion to duty, was in keeping with the highest traditions of the military service and reflect great credit upon himself, his unit and the United States Army. Staff Sergeant Johnston Dunlop died a Warrior's death in the first month of his extended tour in Vietnam. He gave all he had and then some in his quest to complete the mission. Through his selfless service and dedication to duty he made the ultimate sacrifice in upholding the highest traditions of the Ranger Creed, "I WILL NEVER LEAVE A FALLEN COMRADE BEHIND". Staff Sergeant Dunlop by way of his gallant actions truly exemplified the Ranger Motto, "RANGERS LEAD THE WAY."